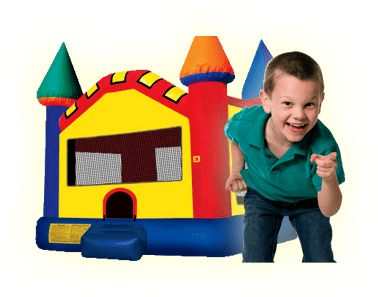 Football Challenge | Bounce Houses R Us | water slide and bounce house rentals in Glenview, Illinois . 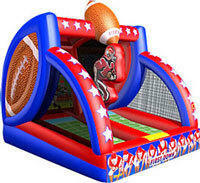 Get your team together and test your Quarterback skills with the inflatable Football Challenge game. The First Down game is an exciting inflatable game that lets players young and old show off their passing game. Future quarterbacks can face off with each other, as they throw the football across the field to the back wall that holds a line of receivers. Once the pass is completed, the football then is returned to the opposing quarterback's lane. The competitive spirit of this inflatable game really gets going as each player tries to get rid of all of their footballs. Each First Down inflatable game features linebacker and receiver artwork, along with a simulated football "field" and three-dimensional footballs at the top of the unit.